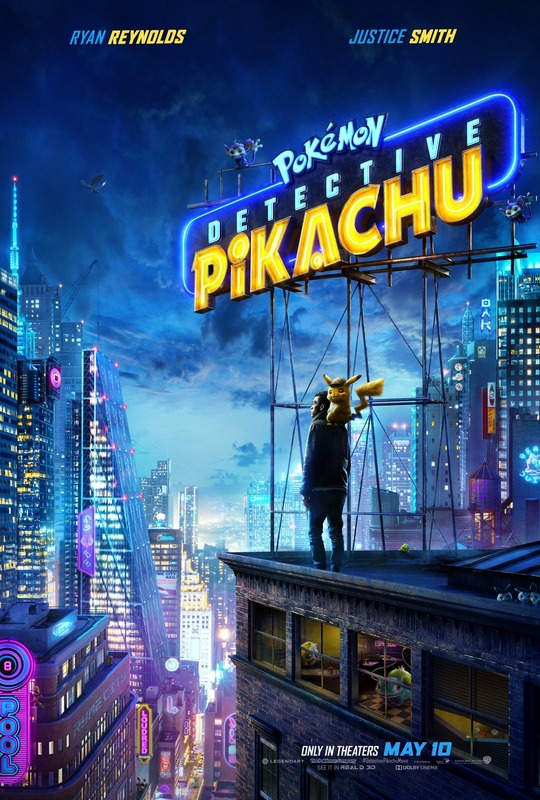 These are the first lines we see and hear as our movie begins and I am transported to a game that used computers when I was around 12 and that was Oregon Trail. 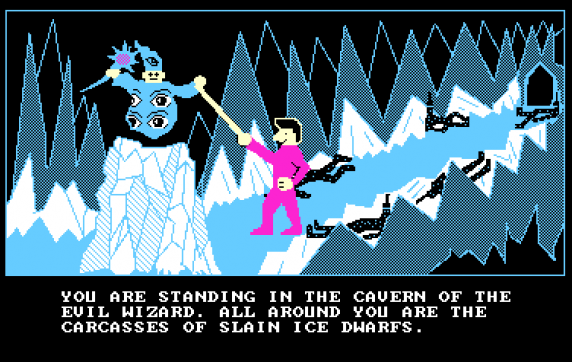 No evil wizards, no dwarfs, just a few covered wagons and a little money and if you chose wrong, you died. That’s what was great about being a kid, the stuff that took risk back then had a reset button and extra lives, and you could always try again. 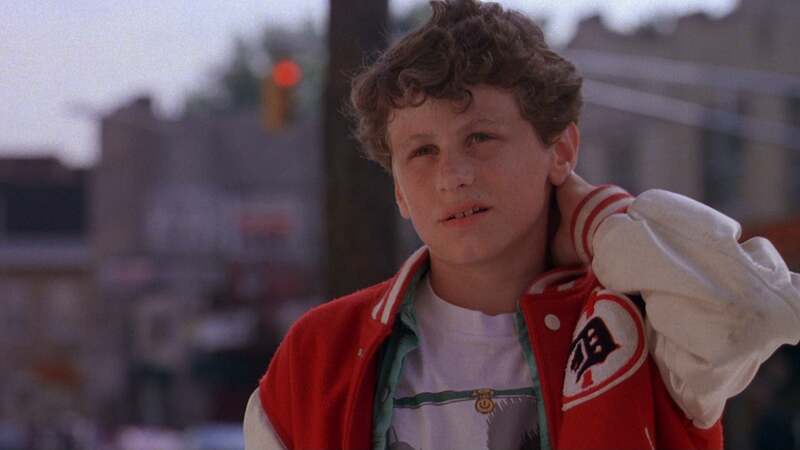 The point in that little comparison of mine is that in the movie Big, Josh Baskin makes a choice as a child and wishes to be big on a Zoltar Speaks machine after being embarrassed in front of a girl he has a crush on. That choice changes Josh; I like to think, for the rest of his life. He has to win back his best friend and live as a 12 year old in a 30 year old body for about a month and a half in New York City. That means he has to get a job and try his best to fit in with those around him in his new version of normal. Its only upon meeting the president of the company he is employed by that he gets a dream job of playing with toys for a living. This affords him to move out of the flophouse he was staying in and move into much nicer digs with every amenity a kid could want. While in his new position with the company he becomes close with Susan and they have a whirlwind romance that brings the child out of her and makes a man out of him. 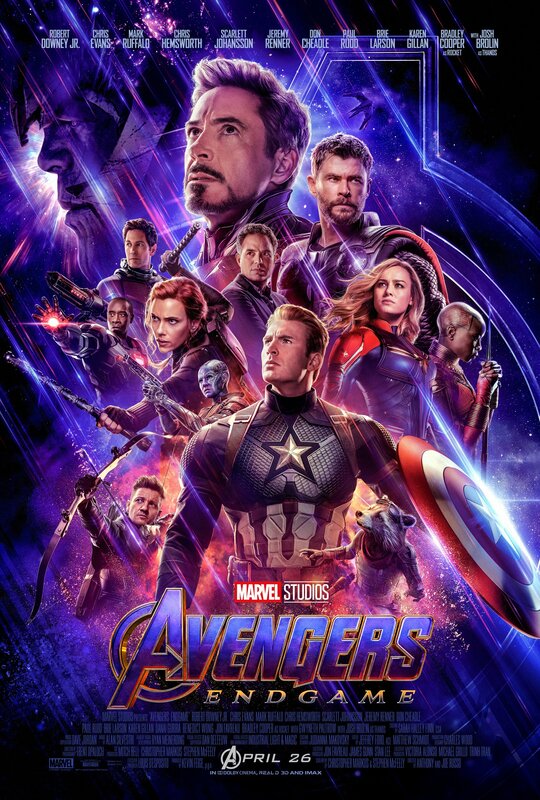 In the meantime, Josh’s best friend starts to see him slipping further and further away and has to put the situation back into perspective for Josh, who then makes another choice to go back to being a child again at the end of the movie. 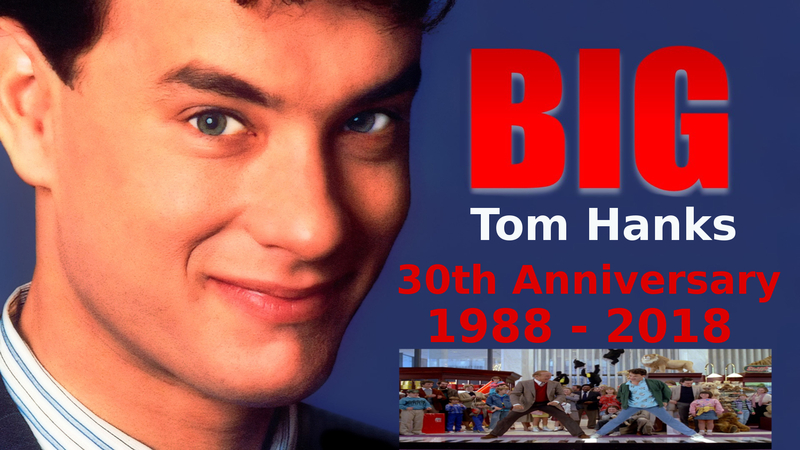 Big was the first full feature film directed by Penny Marshall, only having directed a handful of television episodes and being brought into “Jumpin Jack Flash” after the previous director had been fired during production. 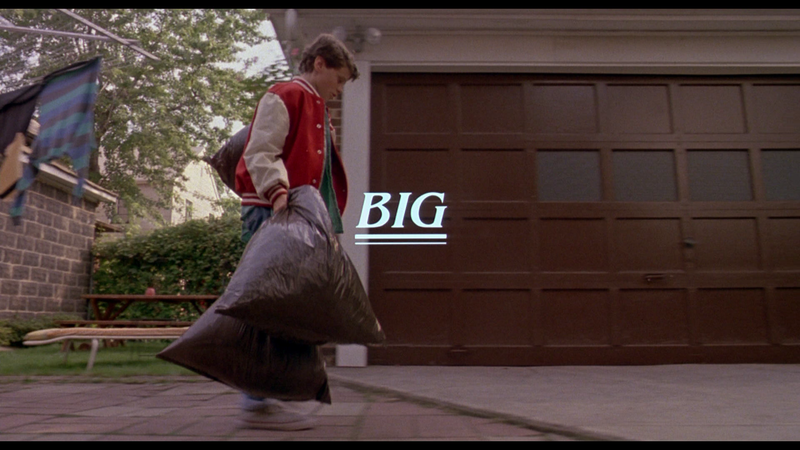 But Big is credited as Marshall’s first full-length motion picture debut and it was a biggie!! Yes, pun intended. 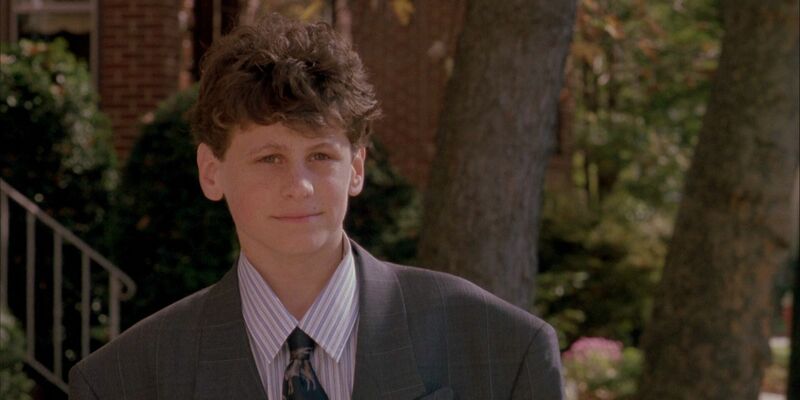 Tom Hanks brings the adult version of Josh Baskin to life and to be honest when I first saw this, I thought they had used his son or something to play the 12-year-old (David Moscow) cause it was like a dead ringer moment. It was easy to believe in magic with these 2 actors bringing the character of Josh to life. It was as if Moscow had been Hanks and vice versa (yet another body swapping movie that came out about the same time). In actual fact, Hanks requested that Moscow act out all the adult scenes, even those with Susan (Elizabeth Perkins), and just act as himself in the situations. Hanks then watched these videos and got down as many mannerisms and little movements as he could so he would appear to truly be 12 on the inside. 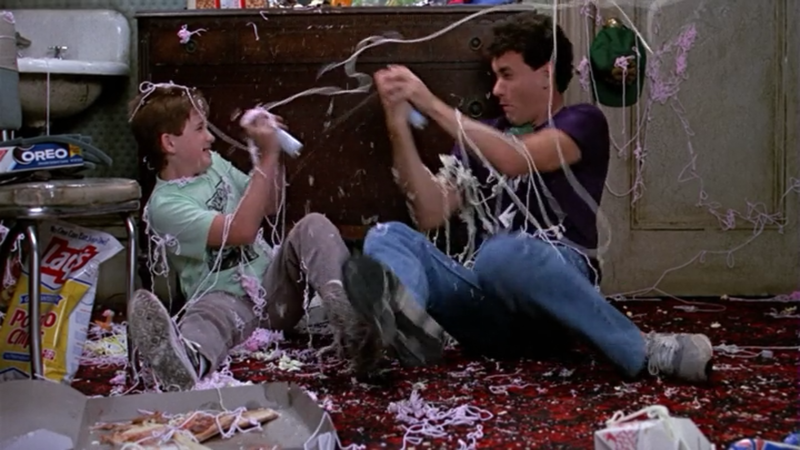 It also helped that Hanks’ son was about the same age as his character, and the little rap/rhyme that Josh and Billy (Jared Rushton) do in the movie was actually something he and his own friend did. Hanks had his son teach him the rap and all the movements and taught it to both Moscow and Rushton so that they all knew the same movements so every time it would be seamless. That is dedication and passion for ones craft! 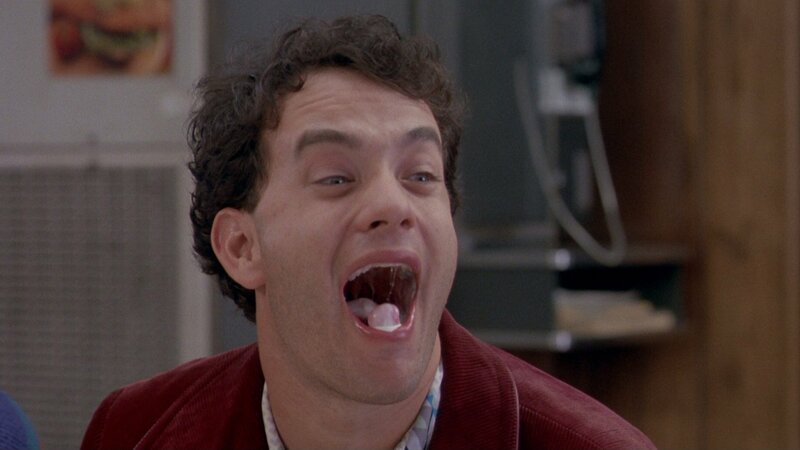 It is, in fact, that kind of tenacity in this role that earned Hanks his first nomination for Best Actor in a leading role at the 1989 Oscars. 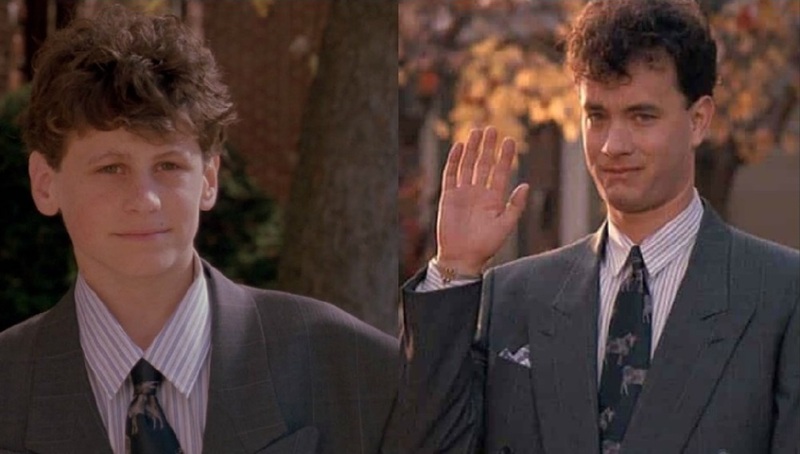 Hanks didn’t win this time, but there were to many other opportunities later in his film career. It only takes a moment and Billy’s face turns from fear to confusion to relief. 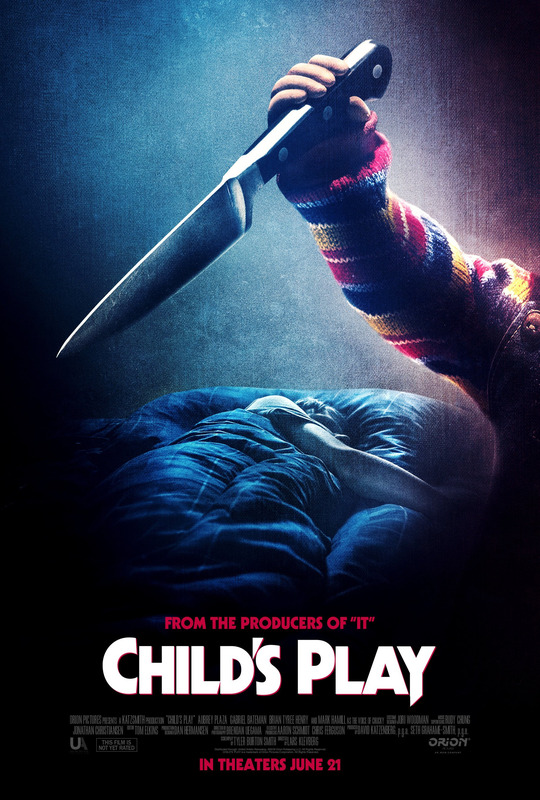 Rushton, (being a child actor), really had a lot of responsibility himself. 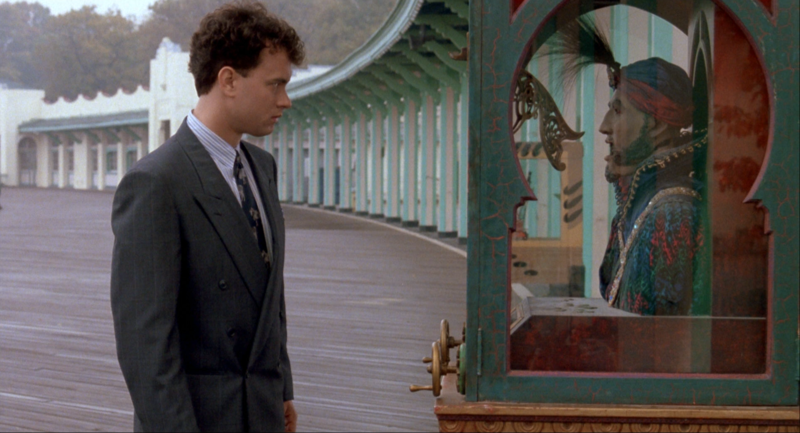 He had to treat Hanks as a kid and even more so toward the end of the movie by becoming the voice of reason as Josh becomes lost among the life he has adopted over a months time while waiting for the results of the Zoltar Speaks machine whereabouts. 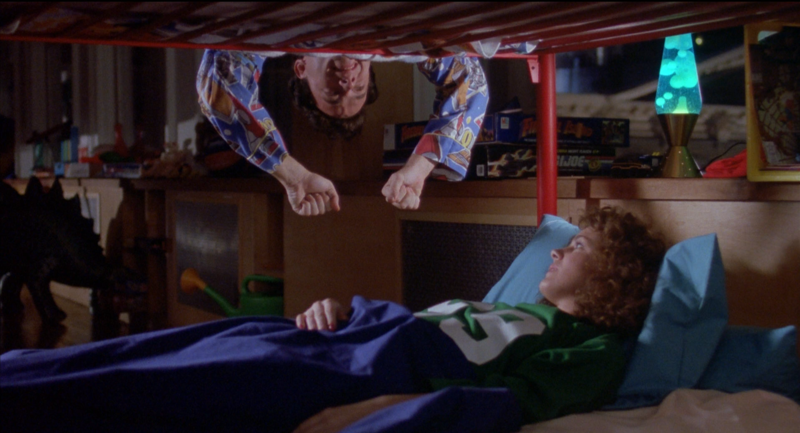 Billy takes Josh under his proverbial wing and helps him find the flophouse, get the job at MacMillian Toys and still be a kid himself going back and forth from his own home and to Josh in New York City. 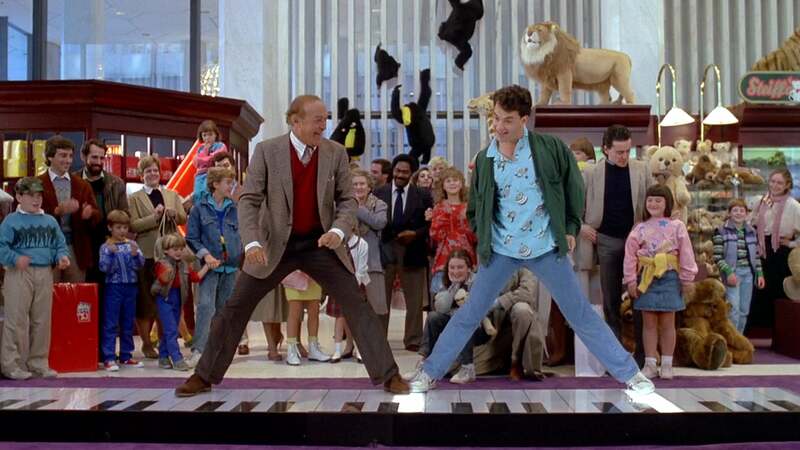 F.A.O Schwartz was the location used for MacMillian Toys where Josh and MacMillian (Robert Loggia) officially meet for the first time and hit it off talking about toys, what is good about certain ones and what’s wrong with some of the newer ones. While walking around oblivious to it, they walk onto a giant floor piano. 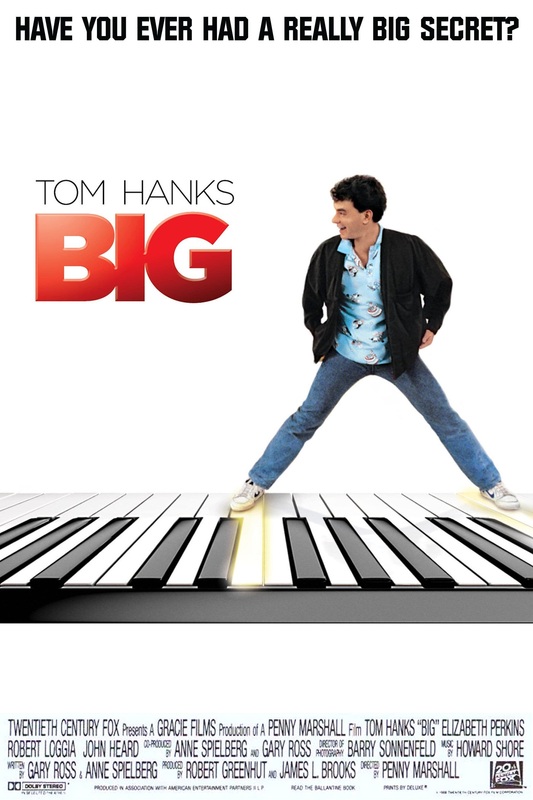 On one of the special features, Loggia said that Marshall had a mock up made and sent to his home to work on the choreography for “Heart and Soul” and “Chopsticks”. You know the scene. Both of the men dancing on it, lighting up the keys as they hop up and down practically a seamless production and to me, what poetry in motion should look like. It’s after this encounter that Josh is made Vice President in charge of Product Development. After just a week! This brings Josh to the attention of Susan and Paul who at the time are dating. Paul (John Heard) is convinced that Josh is some kind of upstart from a competitor’s company there to make life difficult at MacMillian Toys. Paul is the antithesis of Josh. Paul is selfish, petty, jealous and just a bully. At this point, Susan is uptight and stuffy, kind of a snob. MacMillian has their company party and Josh shows up in a full on white tux-probably direct from the prom section-but he pulls it off and looks sharp and awkwardly out of place. Standing by the buffet table licking cream cheese out of celery stalks, repeatedly dipping 1 carrot stick into dip with every bite. 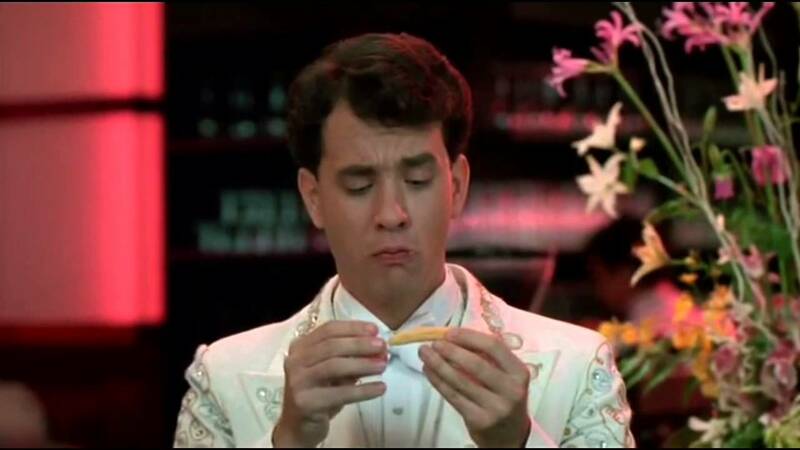 Hanks improvised the baby corn, according to Marshall on the special features. Susan goes up to Josh and suggests he try the caviar so he does and it is abundantly clear he HATES IT, spitting it out and wiping off his tongue as if it were battery acid. Afterward she asks if he wants to leave and he suggests they get a burger. They ride in the back of the company limo and she’s going on and on about how she’s feeling vulnerable and blah, blah, blah, yet all Josh wants to do is play with the limo’s buttons! She asks if they can go to his place and says that she would like to stay with him, he says “like a sleepover? Ok, but I get to be on top”. Oblivious to her obvious sexual advances. Upon entering his apartment she’s face to face with many different toys, games and a giant trampoline. He literally drags her up onto it, lies down and says, “Jump” to her. She isn’t having any of it until he gets up and says its easy, holds her hands and helps her loosen up and have fun. We as viewers are treated to an awesome shot from outside the apartment of the 2 of them jumping up and down in tandem and oblivious to the world, like kids on a playground. Paul’s jealousy has come to a head after Susan left the party with Josh, as he questions her all about her night and its visible how he becomes more and more upset as their drive to work continues. Paul takes Josh out for an unfriendly game of “outdoor racquetball” and they have a great schoolyard fight while adults and kids alike watch along the fence row, laughing and tittering. Josh has some minor abrasions to his knee and head, which Susan treats. She treats Josh like a mother would treat her injured child when he doesn’t understand why Paul punched him and she says its cause he is afraid of Josh. His innocence seems to bring her guard down and she is smitten with him. Billy and Josh are out at an Italian restaurant, the kind where the waiters sing and toss dough around and catch it in their mouths as the patrons throw it back to them. My mother and I visited a restaurant similar to this over 2 decades ago. It was outside Springfield, MO and was know as “the home of the thrown rolls”. It’s the closet thing I can compare to Billy and Josh’s fun time. It happens to be Josh’s birthday and the staff brings out a cake with 13 candles on it. Billy asks him “So what are you gonna wish for this time?” Billy is all ready to go out and play with Josh but gets blown off cause Josh wants to spend time with Susan. 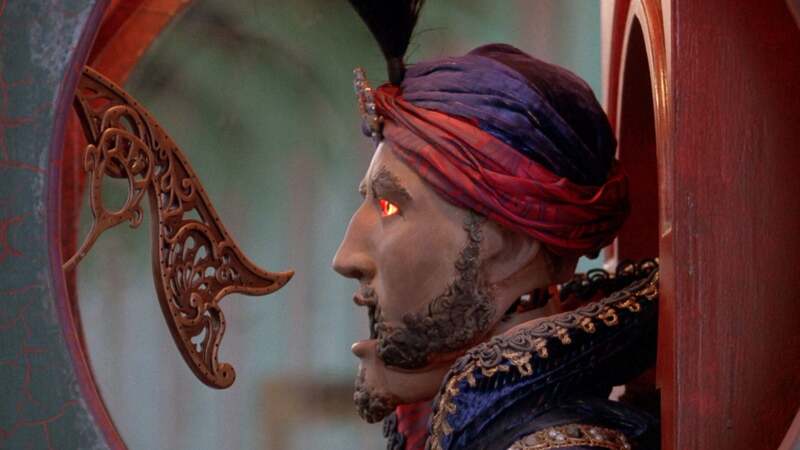 Josh and Susan end up at a carnival fairground and he is so into what he’s doing that he doesn’t even notice the Zoltar Speaks machine that is shown to the audience as they walk toward music. As they dance, he is acting just like you would expect, stiff back, unsure of where to place his hands and lots of space between them. Susan is much more at ease with herself. Josh is at a disadvantage and pulls away from her and softly says, “Susan, I have to tell you something”. He is just a breath away from telling her the truth but instead kisses her tentatively at first, then deepening the kiss as they lean into one another on the dance floor while the music continues playing around them. Movie magic (and some good editing) puts the couple back at Susan’s apartment as the music plays on and their kissing becomes more passionate while still being very gentle. Susan steps back from Josh and begins to unbutton her blouse at an achingly slow pace and all Josh can do is stand back and watch as she opens her blouse, exposing her bra. She reaches just behind him and clicks the light off, all the while he hasn’t stopped ogling, without missing a beat, he clicks the light right back on. Josh is very slow to touch Susan’s breast caressing it and feeling its weight in his hand. He loses his virginity that night, with the lights on to take in everything. 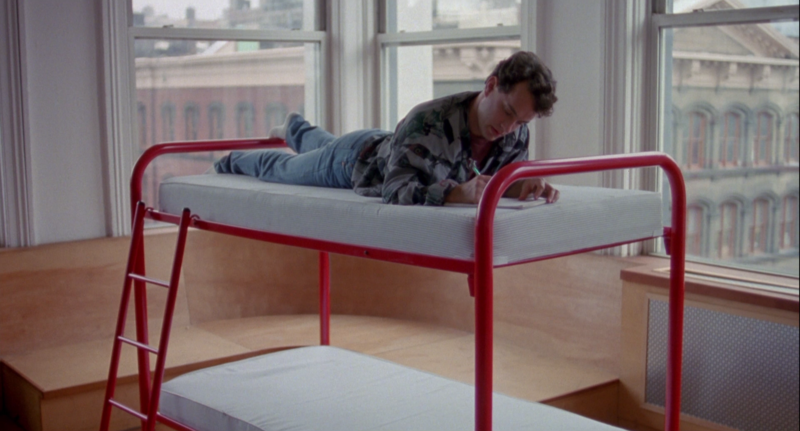 Its sweet because of the way Hanks plays it, but my mind also goes back to the special features where David Moscow had acted out all the scenes with Elizabeth Perkins. Was this “deflowering” scene one of those? If so, I don’t know how to feel about that. 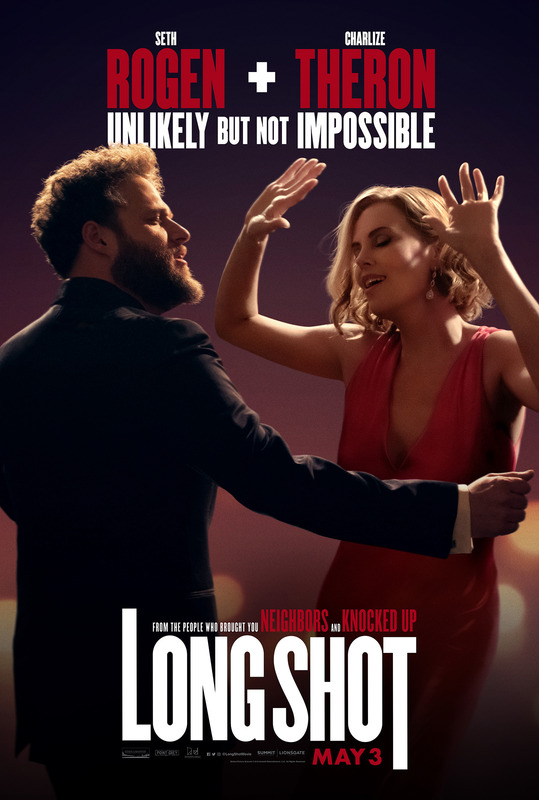 I realize it is just a movie, but the implication of running a psuedosexual scene with a minor doesn’t sit well with me. I’ve tried to find out more information in the usual online places and have come up empty. Josh has been given the task at MacMillian Toys to come up with a new toy line with Susan handling the marketing side of things. He comes up with the idea for a comic book with buttons to change the story or it’s ending. At about the same time, Billy receives the list in the mail and tries to get a hold of Josh by leaving multiple messages. He’s had enough, so Billy brings the list directly to Josh and they have a fight about how getting Josh home where he belongs is more important than anything else and when Josh tries to blow him off again, Billy goes into a tirade reminding Josh just who he really is. Josh goes on a soul-searching montage as he goes around his hometown and he realizes he really does want to go home. The night before their big presentation Josh tells Susan that he wants to go home, and naturally she thinks “Oh God, you’re married!” He goes into telling her the truth about the Zoltar Speaks machine and making his wish and that he is only 13 years old and not ready for any of the things that have been happening to him over the last month. Needless to say, she doesn’t believe him, instead thinking he is just not ready or willing to make a long-term commitment to her. And in a twisted kind of way, that is correct. Billy has one last ditch move to bring Josh home. The Zoltar Speaks machine is at Sea Point Park, NY. It’s up to Josh to make the decision to go ahead with the meeting or leave. He goes to the meeting but excuses himself after some ribbing from Paul so Susan takes over. As she talks over the particulars with the group about company cost and retail costs that a child would actually be able to afford, it dawns on her and she goes after Josh. Billy is outside the building cheering Josh on as Susan comes out of the building and begs him to help by telling her where Josh was heading to. 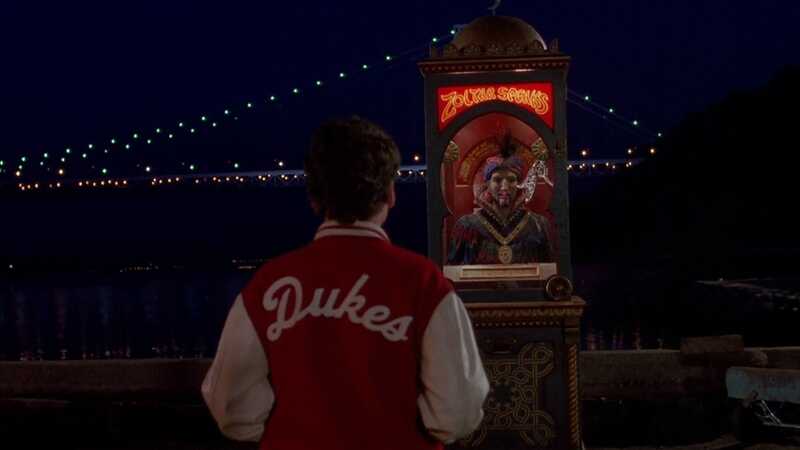 At Sea Point Park the Zoltar Speaks machine is plugged in, so Josh unplugs it and hits it a bit until it comes on without any power, as he did when he made his initial wish. He lines up the ramp and makes his wish just as Susan pulls up in her car. She tells him that a person just doesn’t up and walk out like that without good reason, click, his card falls out and reads “Your Wish Is Granted”. “You got your wish, so how old are you 15, 16?” Josh says he’s 13 “Well, that explains a lot” Josh tries to talk Susan into coming back with him but she declines saying she’s already been there. Susan drives him home, still an adult. They say their heartfelt goodbyes and as he walks away he looks back at her looking upon her with the eyes of an adult. She looks away for a split second and Josh is now his 13-year-old self again wearing his now oversized pinstriped suit. Its not a sad ending by any means, as Josh runs out of his big shoes and back into his child life. 1.) John Lovitz as Scotty Brennen, Josh’s cubicle neighbor when he is first hired to work computer input at the toy store. Lovitz brings his type of humor that he’s known for and he has a couple of funny lines. 2.) Debra Jo Rupp as Miss Patterson, Josh’s secretary after his promotion. She doesn’t have many scenes/lines but her voice made my ears twitch. Yep-that is Mrs. Kitty Foreman from That 70’s Show!